Some Cree are paying tribute to a young diver who went missing off the coast of Mexico. 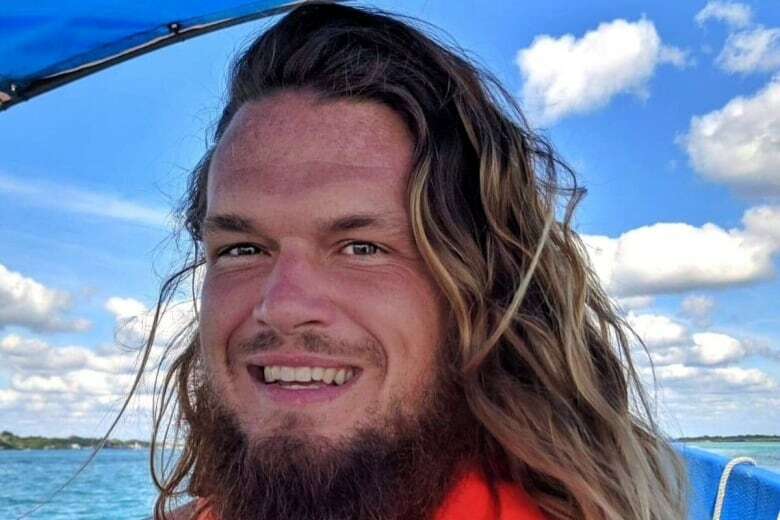 Cameron Donaldson was scuba diving with his mother near Cozumel on March 16 when he didn't return from a dive as expected. The affection many in the Cree Nation have for a young Quebec diver missing off the coast of Mexico is clear. Cameron Donaldson was scuba diving with his mother Bonnie near Cozumel on March 16 when he didn't return from a dive as expected. 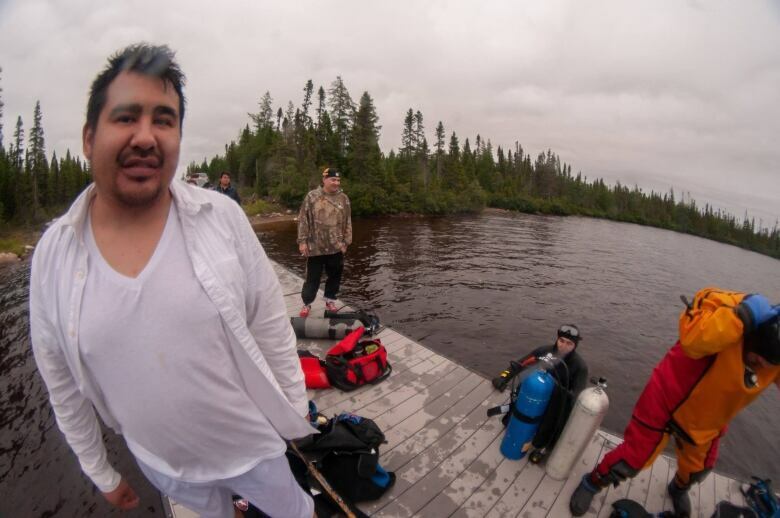 For many years Donaldson has lived during the summer months in the James Bay community of Waskganish and offered therapeutic diving lessons for people with disabilities and post-traumatic stress disorder throughout the Cree Nation. It was during a scuba-diving course Donaldson gave in Chisasibi last Fall that Timmy Herodier, 31, first met him. "He made me a better person," said Herodier, who is currently head lifeguard in Eastmain, another Cree community. "He was a very, very good guy." Herodier says he and Donaldson had been in touch just a few days before he went missing and both were very excited to organize scuba-diving lessons for later this year in Eastmain. Herodier says Donaldson's passion for diving is only a small part of why he connected with so many Cree. "He encouraged and helped a lot of people," said Herodier. "He made me open up a lot to myself." Tributes to Donaldson are also circulating on social media in the Cree communities. 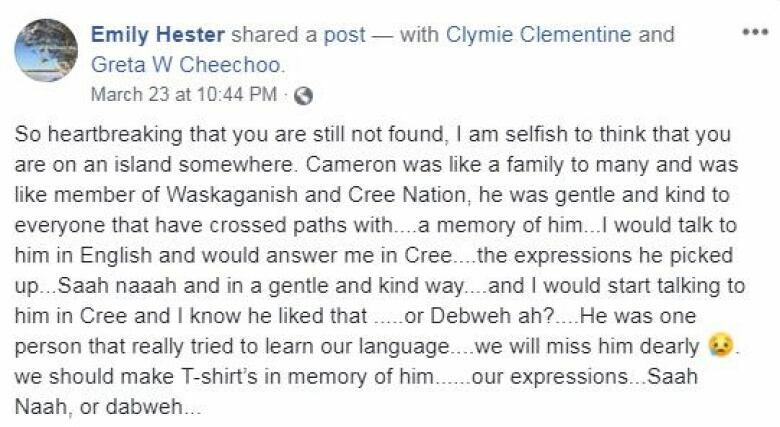 "Cameron was like family to many and was like member of Waskaganish and Cree Nation," wrote Emily Hester on Facebook. "He was gentle and kind to everyone he crossed paths with." Hester also wrote about Cameron's ongoing efforts to improve his Cree language skills. "He was one person that really tried to learn our language," said Hester. "We will miss him dearly." "You were a kind, loving and adventurous person," wrote another woman, Angela Ottereyes, on Facebook. "I'll miss you my friend." Several people in the Cree Nation have also contributed to the GoFundMe page that was set up in the days after he went missing. That campaign raised more than $60,000 in just a few days to help in efforts to search for him. Last Friday, the community of Waskaganish held a radio-a-thon which raised more than $12,000 toward those efforts. Over the weekend, family friend Ray Moore posted a message sharing that the search for Cameron has been called off. "It is with great reluctance and heavy hearts that we acknowledge that in the absence of a true miracle we will never again see Cameron alive," wrote Moore. "The outpouring of love and support during our search efforts has been amazing and yet unsurprising. The world is full of wonderful people and Cameron found many of them as friends."